Topps 2016 Update to their flagship Baseball card set is just now starting to hit store shelves, and like in years past it features the popular "First Pitch" cards as one of its better inserts -- at least in my opinion. After all, what fan doesn't enjoy watching (and possible making fun of) the multitude of stars who try to show off their Baseball prowess. So, it's only natural that a real Baseball card be made available in their honor. BTW, my favorite "First Pitch" card is probably the one they made to celebrate 50 Cent's fantastically horrible first pitch at CitiField a couple years ago. Check out that card here. Also, you can watch 50 Cent and his terrible aim here. Like in years past, Dodger Stadium always seems to be featured more often than any other stadium -- for probably obvious reasons. So, seeing Dodger Stadium represented in three of the ten cards in the set is of no surprise. Check them all out below. I also include a video of their respective throws. 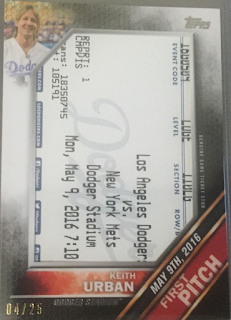 On a side note, this years Update set includes "First Pitch Ticket Stub Relic" cards, as well. Which is strange considering Dodger Stadium no longer prints out actual ticket stubs anymore -- at least not for season ticket holders. Anyway, at this early juncture I have yet to see any of these, so I include only a directly checklist below. I will update this post once photos start showing up. 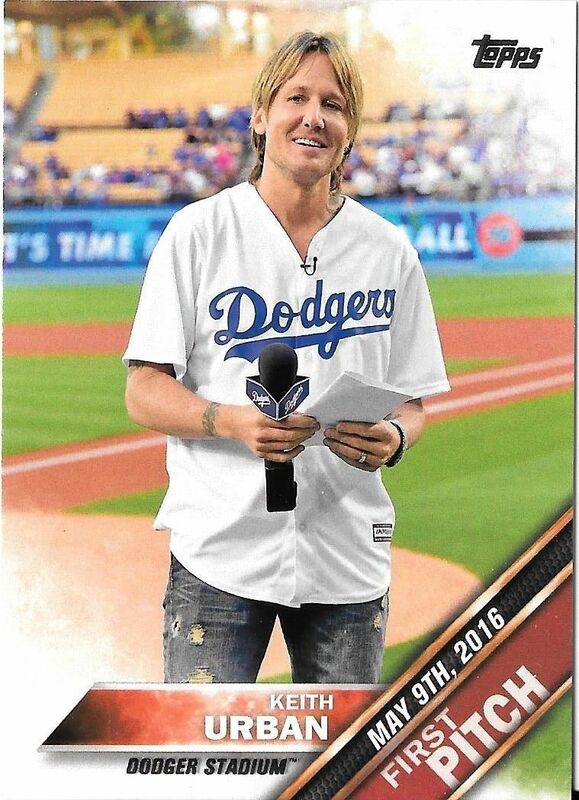 Below are the "First Pitch" cards for Keith Urban, Aubrey Plaza and JoJo Fletcher. 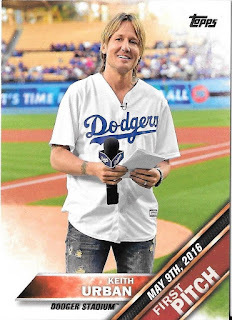 I thought I would note, at least from what I recall, that Keith Urban did not actually throw out the first pitch on May 9th, 2016. Instead, he said the words we all think when the game is about to start. Last week I pointed to a couple of fantastic vintage photos featuring the famed clown Emmett Kelly as the Brooklyn Dodgers "Bum" in 1956 that is currently for sale at REA. Below, I take a closer look at some other Dodgers-related goodies from that same auction. Above is a very rare 1888 Joseph Hall team cabinet photograph of the Brooklyn Bridegrooms. (Auction Link) Both Bob Caruthers and Adonis Terry are featured in the photo. BTW, please note that photo was taken at teams home field at Washington Park located on the corner of 3rd Street and 4th Avenue in Brooklyn. In fact, the photographer, Joseph Hall, had his studio in Brooklyn, so nearly all of his Baseball pics (including his Old Judge's) were taken there. 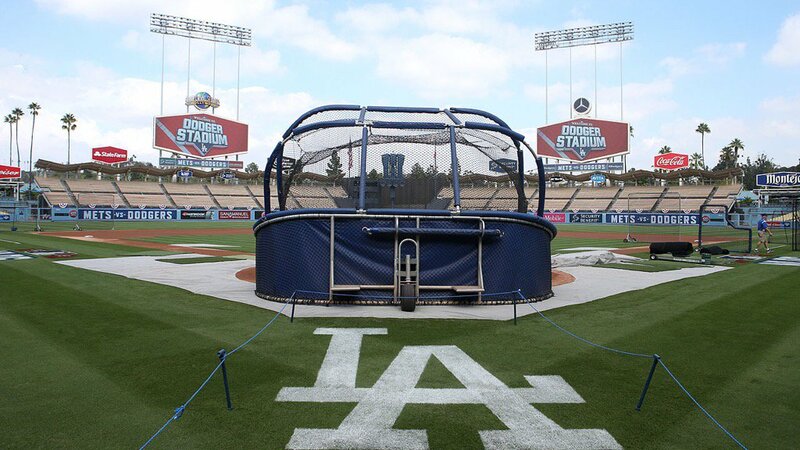 Dodger Stadium sure looks ready for today's Game 3. It all begins at 5:08 PM tonight. 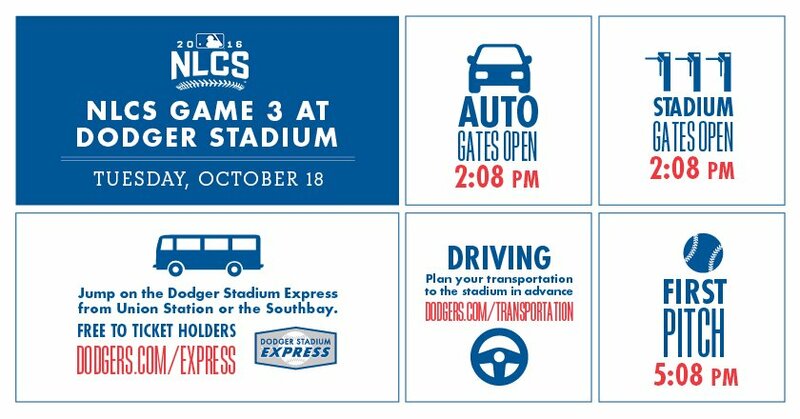 BTW, both the auto and stadium gates open at 2:08 PM. This Day in Dodgers History: This is one of the worst days in Dodger history. In 1977 Reggie Jackson slammed three home runs against the Dodgers in Game 6 at Yankee Stadium to win the World Series. Happy Birthday, Alex Cora and former manager Burt Shotton!